We are talking about bass fishing line. So before I start rambling, let me ask you a question. When was the last time you changed out the line on your reel? If you have been bass fishing lately and been fighting big bass and fishing heavy brushy cover, then you need to change the line out if you have not done so. But don’t do that just yet. Hang with me for a little while and talk about all the different bass fishing lines. You can go pull a big one out of the lake later when the sun is about to set. Choosing one of these types of lines depends on a few things. Are you fishing structure and cover or open water? What rod and reel combo are you using? What size and type lure will you be using? Are you using top water or bouncing off the bottom? There are a few factors to consider when choosing the right line. Monofilament line is made of a single strand of Nylon. It is stretchy which means it gives just a little when you set the hook on a big bass. It floats so it is great to use with top water lures. It is easy handling or casting which means more control during the cast. Not very good at resisting nicks and scrapes. Which means you may be losing lures if you don’t check your line often. Just about any knot can be tied and trusted on this line. Fluorocarbon line is made of carbon and something called fluorine. I am telling you this bit of information because you might use it if you are ever on the game show JEOPARDY. Maybe you could win some big money with that answer. Just maybe. This line has an unusual trait. It is invisible. Mr. Bass cannot see the line as he is inhaling his evening meal. Is that fair? Yeah, I think it is. It is tough and resists nicks and scrapes. It sinks in the water. So it is good for Carolina rigs and deep diving lures. Mr. Bass cannot see the invisible line. 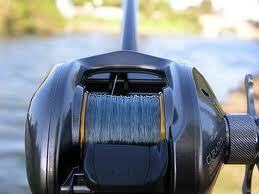 It’s kinda stiff so the higher test lines do not work well in all reels. Knots will break if not lubricated before tightening. Stren and Berkley are two well-known manufacturers of monofilament and fluorocarbon bass fishing lines. Braided lines are sometimes called Superlines. Spiderwire is a well-known manufacturer of this type of line. They are composed of two or more lines braided together to make them extremely strong. New technology now fuses these braids together with heat. This process also makes the braided line very tough and resistant to nicks and scrapes. If your lure gets hung up on deep structure, there is only one thing to do. Do not get your knife out. Get your wire pliers and cut off. It’s tough like I just said so it resist abrasion. Knots don’t work too well on this line. Does not stretch hardly at all. Very sensitive so you feel every little nibble. NOT invisible! Mr. Bass can see the line while he inhales his breakfast. Back lashing with this type line will make you think about using a cane pole! Bass fishing lines vary in many ways other than type. Visibility, Sensitivity and Strength also play a major part in choosing the correct line for your situation. Sometimes though, trying to figure out which line goes with what lure, on which rod and reel combo on a cloudy day in stained water is just too much to think about. When tying a hook to your fishing line, it is very important to use a knot you can trust. 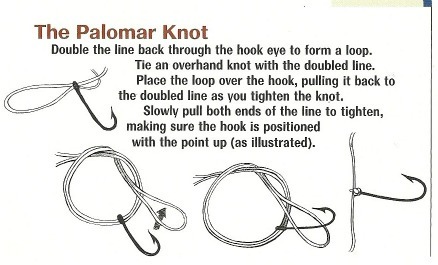 The Palomar knot is widely used because it keeps the hook secured to the line and you don't have to worry about it slipping. Here is an illustration on how to tie the Palomar knot. Reference: Advanced Bass Fishing Skills:Best Lures,Techniques and Presentations.